Ever wished you have a sandwich bread that can hold the fillings in like a pocket? This is probably what you are looking for! Pour in all the remaining dry ingredients and mix well. You could substitute the flour with a mixture of 2 cups all purpose flour and 1 cup of wholemeal flour for a healthier version. Tip off the content onto a lightly floured surface and start kneading. Add more flour along the way if you feel it is still too sticky on your finger. Once it feels more elastic, smooth and not sticky, roll the dough into a cylinder then cut into 8 equal sizes and roll each of them into small balls. Line a baking tray with a baking paper. Roll each ball using a rolling pin to about 6 inches in diameter and arrange them on the baking paper. Do this until you have completed all the 8 balls. Cover the baking tray with a damp towel or a cling film and leave them to rest in a warm place for 30 minutes. Place one tray at a time into the oven. Bake for 4 to 5 minutes or until lightly brown and puffed up then flip to the other side and bake for a further 3 to 4 minutes or until the other side is also lightly browned. 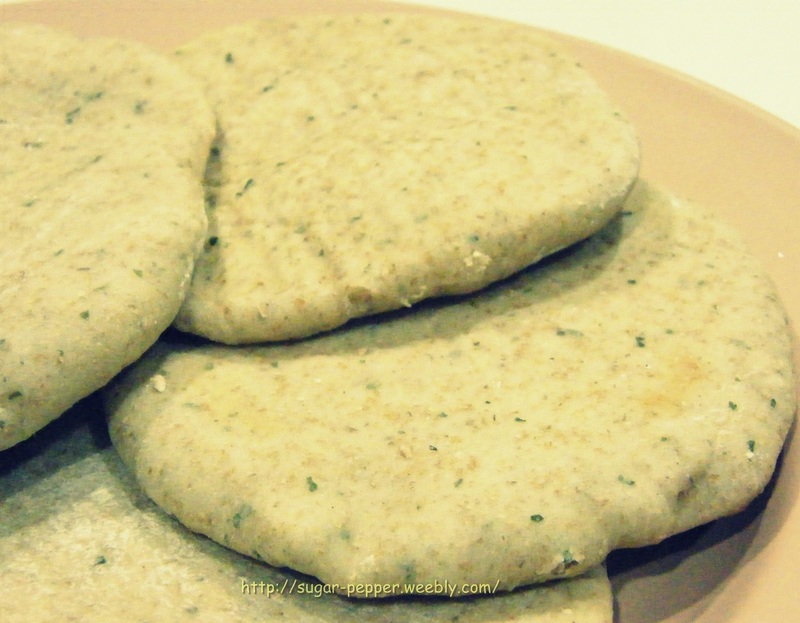 Transfer them on to a plate then cover with a cling film so that the steam from the hot pita bread softens it. Once cool you can transfer them into an air tight container or a seal-able bag and keep refrigerated. To fill this pita bread, you could either cut the pita in half and you will get 2 pockets OR you could slice around 1/3 to 1/2 of the perimeter of the pita (like filleting the pita bread) carefully so as not to poke your knife into the other side of the pita bread and you will get a large pocket.